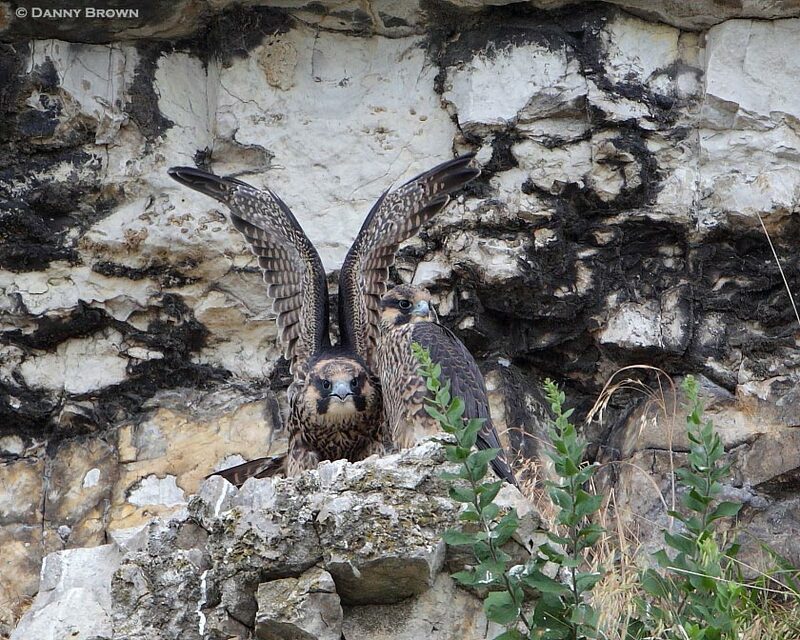 Two of a trio of fledgling peregrine falcons stretch their wings and watch the Mississippi River go by. The third was off practicing its newly discovered flying skills. It’s too rainy to work or play outside so I’ll catch up here with another trip report. 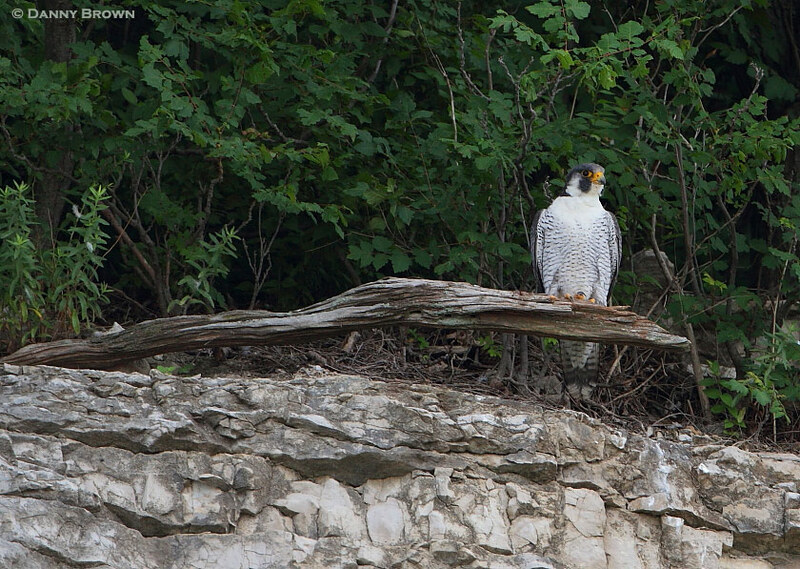 Over the last few days I visited the peregrine falcon family on the bluffs just north of Alton, Illinois. The falcons chose a great nesting site with plenty of room for viewing from across the Great River Road in a nice-sized pull-off for parking. My friends, Brenda, Barb and Deepa joined me and we even brought lawn chairs to sit and watch the falcon action. We were treated to feeding frenzies, attacks on vultures, 100+ mph dives, songbirds being ripped to pieces and fed in morsels to the young, and all kinds of other delights. Prior to this week, I’ve always found the Cooper’s hawk to be the ultimate aviator but now that has all changed. It would be impossible for me to describe the flight skills of the peregrine falcon. Sometimes it seems that they are barely twitching the ends of their wings as they accelerate through the trees along their bluff home! Watching these falcons was an experience of a lifetime. Mama falcon takes a break from her needy (and loud) young after a pigeon feeding. Papa could be found at the highest point on the bluff atop a stately snag tree. I’m sure glad I decided to see the falcons for myself. Two half-days of photographing and birding with some of my “bird nerd” friends was just what the doctor ordered during the monsoon we’ve been experiencing in eastern Missouri. Good times! I enjoyed the “Missouri monsoon birding”, too, immensely. These birds kept me riveted, and so does your beautiful image of two of the nestlings! Thanks Deepa. Glad you enjoyed them. That’s Awesome photo of a Peregrine Falcon, Danny. I would have liked to seen, the frenzies feed myself. I will bet that it was spectacular. Thank’s for sharing. It was polite of the falcons to nest in an accessible spot! Great shots. I’m so happy I am one of your “bird nerd friends” and was able to go with you to see these amazing falcons. You captured them quite well with you camera lens, Danny….beautiful shots! WOW! What a spectacular shot!